Taking a short break from the Walk Through the Five Ts for the following story. We’ll get back to the Five Ts next week, but this, in my mind, is a very important topic. Especially in a “dose makes the poison” kind of way. But the one question that seems unexplored here is just how this condition came to be. A genetic predisposition? Sure. But maybe the extreme endurance nature of Ryan’s workouts, if not having outright caused the condition, at least exacerbated it? I think it’s a worthy question, and one that at least needs to be considered. 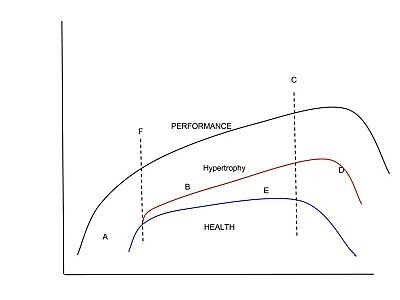 And it’s a question that’s at the heart (pardon the pun) of the Health vs Performance spectrum. Here’s more on the extreme endurance activity vs cardiovascular health question from cardiologist, Dr. James O’Keffe. Interesting stuff. So what does all of this mean? My take is that one’s ability to tolerate endurance activity is a lot like one’s ability to tolerate gluten in the diet. Not saying that either is necessarily “good” for anyone, but it is a stressor that some people seem to have a Teflon-like protection against. And, in other people, this is a stressor that absolutely wrecks the house. In fact, leveraging the most effective dose of exercise — and figuring out exactly what is the most effective dose — is pivotal in our Efficient Exercise program design schema. And this continual evaluation/re-evaluation process is also my top priority from a personal, n=1 prospective. 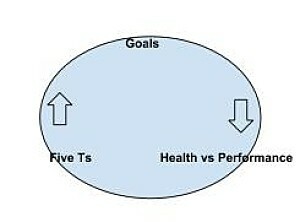 Goals, Five Ts, Health vs Performance; it’s an unbroken chain. Look, I get the competitive drive. And as a former football player (and current health vs performance “envelope pusher”) I’m the last one that ought to be throwing stones. But I think that If you’re going to train seriously and compete in these activities, at least know what some of the unintended ramifications might be. Be on the lookout for them, and be prepared to alter your training should warning signs appear. And a caveat: I can tell you from personal experience just how easy it is to ignore those warning signs. Because that’s what athletes do, right? We push through pain, and get back in the game. And that drive can probably be justified if we’re getting paid to compete, or at least, having an education paid for. But let’s be realistic — some people compete for the simple thrill of competition itself. That competition is its own reward is enough for me, at this point in my life. And I get all of that, too. But still, stress hammers the body nonetheless, and we have to be ever vigilant for the impending cliff-of-no-return. So compete if you must, and train like a demon in the process. Be true to yourself, and really listen to what your body is telling you. Take advantage of appropriate medical testing if you plan on pushing the limits of your body’s ability to tolerate the stresses you put upon it. If you’re in the habit of “playing hard”, ensure you also get in the habit of recovering even harder. Note: Joel Jamieson was kind enough to send me one of his BioForce HRV (Heart Rate Variability) testing kits. I’ll be putting that to the test over the next few weeks, so be on the lookout for my assessment of what I think is some very cool technology. And remember this: genetics are not density. We’ve covered a lot of ground on this subject previously here, here, and here. But the bottom line is this: Epigenetics have plenty to say, and can either turn these genetic switches into “hair triggers”, or go a hell of a long way toward blocking their expression completely. I’m no doctor, of course, but it just may be that if Ryan altered his training toward a more infrequent strength and power bias, it may very well reverse his condition. I think it would at least be worth a shot. And I’m not here to judge (or to say that she didn’t), but I believe Angelina Jolie should have seriously considered — and altered where applicable — the epigenetic factors in her life before taking such drastic measures. It’s true a lot of people are motivated by competition to excel and maybe push themselves beyond their safe boundaries. I guess we mostly don’t know what our boundaries are, and you’re right, we should look at our genetic history – but without assuming we can’t turn it around. Some people do push too hard. A good friend of mine has beaten cancer and having been told he would never get fully fit again has gone in to absolute overdrive. He is mid 50’s and training every day for a full triathlon later in the year. There is no stopping him, he is absolutely obsessed. To be fair he looks ok on it and is certainly much fitter than me, but he is not a big eater and we are worried that he might well be overdoing things. regarding Angelina: It is tempting to say what you said, but really, the solution is drastic, but still the best one. I’ll give you another example of gene mutation: RB1. This leads to retinoblastoma, and there is nothing one can do about it, and the onset is around 2 years of age. So these kids can hardly eat paleo/exercise/avoid stress to stop this from happening, and the same is true for Angelina, although the onset is later. Another example is p53 mutation and Li-fraumeni syndrome. It is basically a gene that orchestrates reparative processes of DNA, a “genome protector”/tumor surpressor. One copy is “off”, so while healthy people have another one in reserve to rely on, these don’t. Multiple tumours are developed in that case as they lose the remaining healthy gene variant…this is called loss of heterozygozity…yes, cancer is in general multifactorial desease, but when body protective mechanisms fail, like at these specific cases, there is very little you can do at the moment. Thanks for offering another point of view, my friend. But surely not *everyone* with specific mutation is doomed?